As we approach the 4th of July holiday, it’s worth remembering that Independence Day celebrates our collective and individual freedom. That’s a value that’s present in nearly every facet of American life, including our work lives. At a workplace, expressing independence often translates to the freedom to make decisions, having the autonomy to set some of your work parameters, being responsible for your product, and getting to use creativity in how you do your job. For many workers, independence on the job makes their working lives more fulfilling and rewarding, while the absence of it can make work feel like a drudge. To be clear, independence does not mean loafing or avoiding necessary tasks! In fact, it may involve working harder and investing more of oneself in work. If you’re someone who has a strong value for independence in your work, there is data to support certain career choices over others. That said, every employer differs, so how you might experience independence on the job can come down to the particular organization or manager you work for, but there are definitely big differences in how much autonomy some careers foster compared to others. Self-employment is an avenue that satisfies many independence-seekers. It generally comes with very long hours, years of reduced availability for other interests, and a degree of risk that make it an untenable option for some. The gig economy—for example, renting out lodging space at your home, or driving for a ride-hailing service—can offer opportunities to choose to work on your own schedule, and to create an environment that suits your preferences. 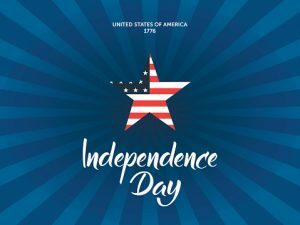 For more inspiration this Independence Day, check out CareerOneStop’s Work Values information, or see a list of high-independence careers on ONET Online.